The evolution of mobile internet technologies has made tremendous progress in the last couple of years, especially with the introduction of the 4th generation technology (4G), LTE. Using LTE, bandwidths with far more than 100 Mbit/s are possible and users all over the world are now enjoying fast and reliable LTE-connections on their smartphones. As of last week, this has also become reality for mobile internet users in Turkey, as the three network operators Turkcell, Türk Telekom, and Vodafone launched their new LTE networks. As P3 group can confirm, the change happened on the night between March 31st and April 1st, 2016. Using crowdsourced data collected across its smartphone apps, it is possible to measure the share of technologies seen by the users. 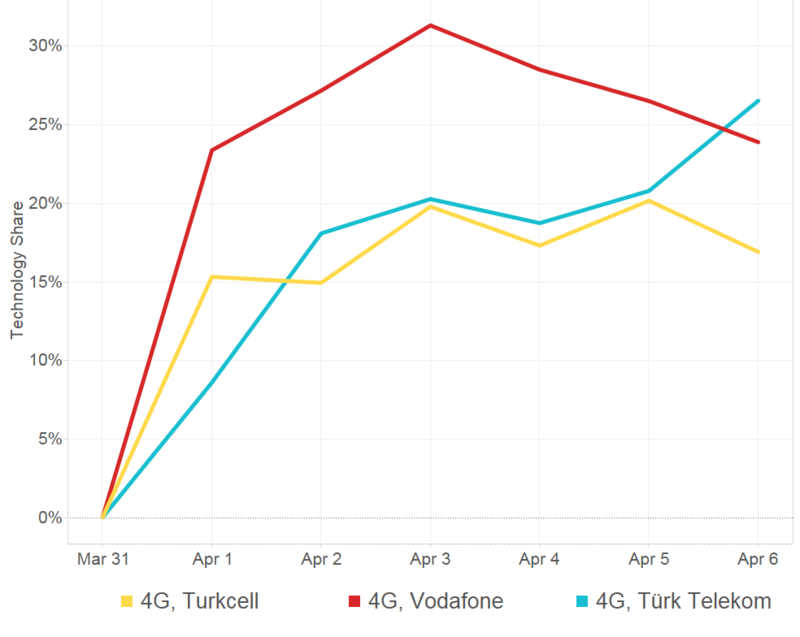 On the basis of the data set of the panel members in Turkey, a sharp increase in LTE share from 0% before April to now 15%-25%, depending on the network, has been observed (see Figure 1). Turkish network provider’s Turkcell and Vodafone Turkey created some attention in the last months by claiming possible speeds of about 1 Gbit/s by aggregating four or five carriers. Of course, this is only possible under ideal conditions, which will not be the case for everyday customers. Not to mention that devices supporting this kind of carrier aggregation will not be available in the near future. Nevertheless, Turkcell claims to improve the possible maximum speed in its network to more than 300 Mbit/s in April compared to just 60 Mbit/s before the LTE launch. The LTE networks of all three providers, also including Türk Telekom’s AVEA, are for now limited to the centers of 81 cities, which means that customers outside of urban areas will not benefit from this huge advancement in the networks. Not even Turkcell’s reported population coverage of 95% in 3G will help here. Although all three carriers promise to quickly extend the reach of their LTE networks in the future, 4G availability will still strongly depend on where the user is. 100% LTE-share in metropolitan areas like Istanbul or Ankara will, as mentioned before, not matter for people who spend most of their time in the country side. So how can you determine whether there is good LTE-coverage in your area? The answer to this question is *U get*. 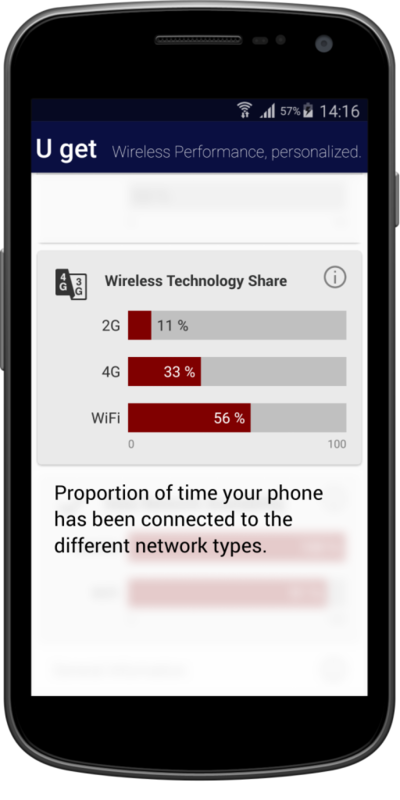 P3’s new flagship app U get enables the user to monitor his or her wireless performance independent of any benchmark conducted by the providers or other companies. U get passively monitors the throughput, network technology, signal strength, and call success, which makes it even better and more useful than any traditional speed test app. U get does not cause any unnecessary traffic, nor does it drain your battery and the best thing about it is that it is absolutely for free and always will be. So if you would like to challenge your carrier’s promises in terms of network availability and performance, and support P3 map mobile networks worldwide, download our app now and join the *U get* community. What’s important is not the network that your provider promises you, but the one U get.